A few big trends for investors to focus on in GameStop's earnings announcement. Video game retailer GameStop (NYSE:GME) is scheduled to post third-quarter earnings results on Thursday. Even after a blowout second quarter, expectations are low for this week's announcement. Here are a few big trends for investors to watch for in the report. GameStop's growth should slow substantially from the blockbuster performance it turned in last quarter, when same-store sales bounced higher by 22%. Revenue grew by 25% over the prior-year period and helped push second-quarter profit up by a massive 144% YOY. For the third quarter, Wall Street expects both sales and earnings to rise by just 5%, to $2.2 billion and $0.61 per share, respectively. For its part, GameStop's management said in August that same-store sales should beat most national retailers and improve by between 1% and 5% over the prior year. Investors shouldn't read too much into that sales slowdown. The third quarter of 2013 included the release of Take-Two Interactive's Grand Theft Auto V, which broke sales records around the world and boosted GameStop's customer traffic to new heights. This year's big third-quarter releases included hits such as Nintendo's Super Smash Bros. and Activision Blizzard's Destiny, but those titles aren't likely to be nearly as popular as GTA V was last year. The good (and bad) news for GameStop is that spiking hardware sales should make up for almost all of that relative weakness on the software side. Next-generation consoles from Sony and Microsoft are still popular, and those devices helped hardware sales climb 60% last month, according to research firm NPD. That popularity cuts both ways for GameStop. It will boost the retailer's top line and drive more customers into stores, but it also pinches profits because new hardware carries the lowest margins of anything GameStop sells. You can see that trend playing out in GameStop's gross profit margin, which is falling as hardware grows to a bigger portion of its overall sales. Investors will want to keep a close eye on this profitability figure. Management expects it to begin creeping higher again as ultra-profitable pre-owned video game sales rebound to a higher percentage of revenue. 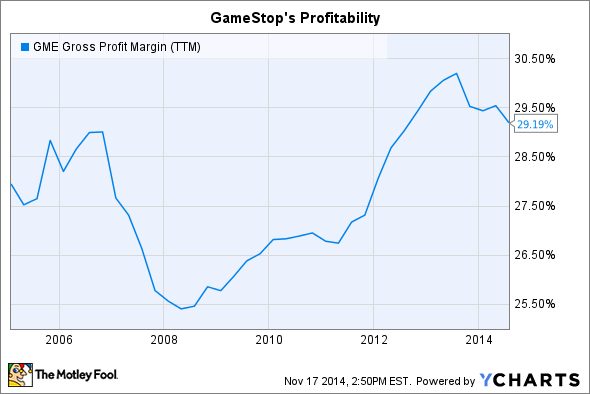 Finally, look for GameStop to make more progress diversifying away from its core video game sales business. That model is under threat from the growing demand for digital downloads. We received one more confirmation of that trend recently, courtesy of Activision. Last month, the game publisher said it delivered nearly 20% of its volume for Destiny through digital sales channels. Those are sales that GameStop could not benefit from, either on the initial purchase or the trade-in. With that in mind, investors should be looking for more news about GameStop's consumer electronics and wireless services businesses, which include its Simply Mac, Cricket, and Spring Mobile shops. In the second quarter, that group accounted for an impressive 20% of the retailer's profit. While that contribution should slip in the third and fourth quarters, it will likely remain a significant portion of earnings. As for the holiday season, GameStop recently announced that it is hiring 25,000 seasonal workers across its portfolio of brands to handle the crush of shoppers, 50% more than it hired last year. That suggests management is confident that it can capitalize on the growing video game and consumer electronics markets this holiday season. Investors will want to see some numbers to back up that confidence in the form of a strong outlook for the fourth quarter.